natsfest schedule | Let Teddy Win! 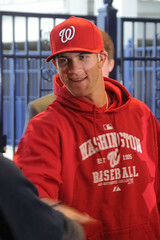 The Washington Nationals today announced the schedule for their 2010 “Winter Caravan”, in which members of the team will tour the Washington, DC area to meet fans and promote the upcoming season before heading south for spring training. Participating players and front office staff include new acquisitions Ivan “Pudge” Rodriguez, Brian Bruney, and Matt Capps; manager Jim Riggleman; and players Adam Dunn, Ryan Zimmerman, John Lannan, Nyjer Morgan, Josh Willingham, Tyler Clippard, and Craig Stammen. Prospects Danny Espinoza, Ryan Speier, and Drew Storen will also participate in the first 3 days of activities. Nats broadcaster Rob Dibble will moderate the sessions. 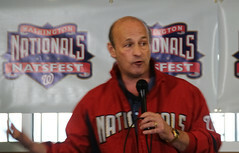 The 10-stop tour will run from January 27th to January 31st, culminating in the second annual Natsfest on January 31st at Nationals Park. 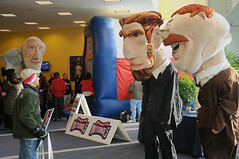 If the second annual NatsFest is as good as the first, it will be a guaranteed good time for Nats fans. 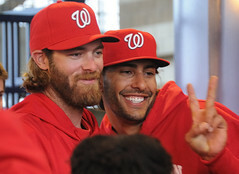 Expect long lines for to get autographs and take photos with Nationals players, but fans will otherwise roam freely in Nationals Park, tour the clubhouse, participate in question-and-answer sessions with the likes of Stan Kasten, Mike Rizzo, Jim Riggleman and George Will, and even take your shot in the Nationals batting cages for a $1 donation to the Nationals Dream Foundation. Nationals Season Ticket Holders will receive up to four complimentary tickets per account and additional tickets should be available soon for purchase at Nationals.com.